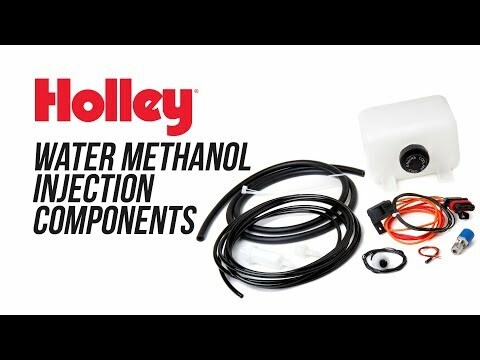 Take your forced induction ride to the next level with a Holley water/meth injection system! 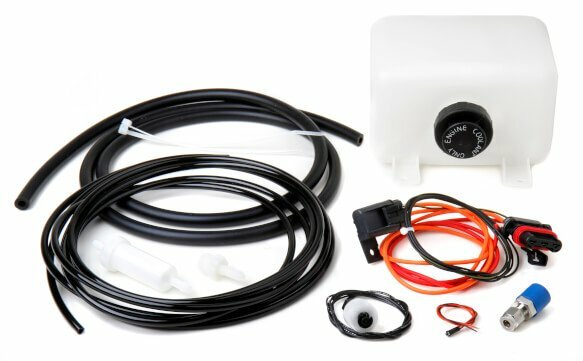 Integrated into the Holley HP and Dominator EFI Systems is the capability to control water/methanol injection, allowing you to safely run on lower octane pump gas! What makes the Holley water/methanol system unique and light years ahead of competitive systems, is that the solenoid flow has been characterized within the ECU. Program in an exact flow amount into the software, and that flow is injected into the engine. This is critical to ensure that neither too little (causing engine damage), nor too much (causing a large loss in power) water/methanol mix is injected into the engine. Select the exact percentage of water/methanol mix to be delivered vs. the percentage of fuel flow present, at any RPM and load. This makes tuning a very simple and accurate process. All components are designed to be compatible with water/methanol mix of up to 50% methanol. The Water/Meth solenoids are run by an injector driver output. If an extra output is not available (as would be the case on a HP ECU driving 8 injectors), PN 554-115 can be purchased that can be driven by a low side PWM output.